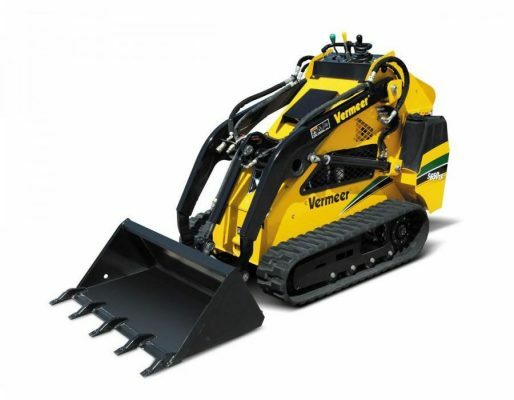 We have a Vermeer 650tx skid steer which will fit through a 43” wide access point and can carry large volumes of branch material, timber, compost and rankings to load awaiting vehicles with its maximum lift height of 2.2m with an impressive operating capacity of 299kgs and a tipping capacity of 857kgs means this machine can lift out material that would require a lot of cutting and hand balling. With a ground speed of 4.5mph this machine can quickly tackle terrain that wheeled loaders will struggle with. This machine is also capable of mechanically feeding our Vermeer BC1000XL although it does damage the ground around the loading area due to its tracking when feeding, we always recommend laying boards over grassed areas to cause even less disturbance of the ground. This machine has large fuel tanks which mean it requires less filling time as these tanks will last approximately 16-18 hours of use on site. The Skid Steer comes with a number of attachments such as the 42 inch standard bucket, log grab, grapple bucket and 48 inch long palette tines. See the skid steer in action on the video below.